You've lucked up with this one! These 308 Surplus rounds, manufactured by Austrian manufacturer Hirtenberger, are some of the best surplus rounds on the market. These 146 grain full metal jacket rounds are very popular, not only because they are a great training ammo, but they were manufactured in the 1970's! They contain a Berdan-primer and a have brass casing. The bullet has a lead core and is magnetic. Obviously, since they are still in great condition, they will resist corrosion. Shoot a few and store a few. You'll be the envy of all your shooting pals when you tell them you have a these highly sought after rounds. They are hard to come by, so go ahead and purchase your 240 round case. Not only are you getting a deal by buying in bulk, you will also qualify for free shipping. I have shot 11 rounds of this ammo, to sight in at 50 yards along with Federal power shok. All shot well and accurately. Shoots well ,no problems, shot at least 50 rounds so far. This product is poor. Only half of the rounds shoot the first time. DO NOT BUY THESE! I purchased this pack of surplus Hirtenberger rounds last year and have not been happy at all. Only roughly half of the rounds fired on the first try. The half of the ones that did not fire on the first try, fired on the second try. Some rounds took four times to fire. I have tried other brands in the same firearm and those all fired on the first try every time. That showed me that the Hirtenberger rounds were the problem. One thing that really irritated me, besides that the rounds were completely unreliable, was that Ammoman would not stand by their poor product and issue me a refund. Needless to say, I have not purchased anything else from Ammoman since, and have taken my business elsewhere and bought rounds that perform well. I purchased a case (960) rounds to fire in my M1A loaded and haven't been that pleased with them. In a 20 round magazine I always have 1-4 rounds that don't fire. I've shot about 2/3 of the ammo with always have duds in every mag. I've tried different ammo (Lake City Federal) and no issues. I've purchased this ammo before with no problem but this batch hasn't been satisfactory. The first 960 rounds that I purchased from another site hadn't a single problem with, which is why I purchased again. After my latest purchase I will not buy them again. Looked very good for the age and shot well in my M1A , it does not like reloads but shot and rechambered these just fine . Accuracy was very acceptable also .Brass will be reloaded for another gun. Only shot 20 rds so far. Ammo looks clean for age. Cycled flawless in my C-308 roller lock rifle which can be picky about some ammo. I have shot 200+ rounds so far in my Ruger American Predator and I was ringing 18" steel from 100 yards out to 500 yards. Even hit the 10" steel at 500 yards. I'm new to .308 but I have no complaints on this ammo. The 70's date kind of concerned me but it shoots like it was made yesterday. Bought a quantity, expecting different election results. But at least I have a surplus now! Shipment was fast, & they made the onerous ID proccess in my state go easier than other online sellers. Haven't tried it, it's going into long term storage. Very impressed with this ammo, can't wait to shoot it. 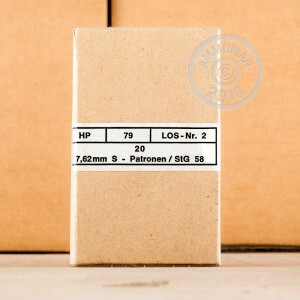 The ammo I got was a 1974 lot, sealed in 240rd battle packs (960rds per case) with a canvas carry handle on each cardboard wrapped plastic pack. The ammo looks as though it was produced yesterday, very shiny, sealed primers, and evidence of annealing. Wish I had bought more. Picked up 900+ rounds a couple months back and have run through about 250 in my m1a scout. Ammo is packed well and arrived quickly. Zero issues so far and lands right where I put the crosshairs at 100 yards (limited at the range in CA) consistently. I will buy again for sure. Very happy with this ammo so far. Fairly clean shooting, accurate as I am ok the gun and all rounds are in great shape in nicely sealed packaging. 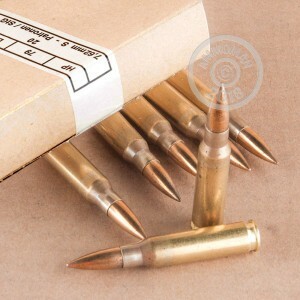 This is some of the finest genuine surplus 308 ammo out there. Definitely keep this on hand for later use as it's getting hard to find nowadays. Good, clean, bright ammo and what I like to see in surplus 308 ammo. It's still popping up, but, cannot go on forever. Well packed for longevity. Wish I had thousands of rounds. I bought this surplus for my PTR, I was extremely happy with my purchase. I shot 100rds of the 308 without one problem through the PTR. This surplus is loaded hot, my bolt rifle didn't like it much as the cartridge expanded in the chamber and was hard to extract. Overall the surplus shoots fine, I will buy more in the future. 240 rounds through the new Scout rifle with no issues. Will be ordering more.